This section is from the book "The Epicurean", by Charles Ranhofer. Also available from Amazon: The Epicurean, a Complete Treatise of Analytical and Practical Studies on the Culinary Art. Cut off the head of a wild boar or wild pig at the neck, near the shoulders; singe and scrape carefully; when well cleaned bone it, beginning under the lower jaw. and when thoroughly boned rub it over with four ounces of salt and one of powdered saltpetre. Lay the head in a vessel with thyme, bay leaf, basil, mace, cloves, juniper berries and carrots; leave it in two days, rub it over once more and let remain six days longer; drain, open, suppress all the aromatics. remove the greater part of the meats, and cut these into half-inch squares. Have a pound of truffles in a vessel with a pound of pork minion fillet cut in half-inch pieces, the boar's tongue and a calf's tongue, both to be pickled (No. 15), cooked and cooled under a weight, then cut in three-eighths inch squares; also have a pound of blanched fat pork cut up the same size, and a quarter of a pound of green pistachios; season highly and mix these ingredients with a forcemeat prepared with two pounds of lean pork, a pound of lean veal and three pounds of fresh fat pork, the whole chopped finely and forced through a sieve. Fill the head with this preparation, close and sew up the aperture, fill the mouth with carrots so as to keep it open, cut off the ears and cook them separately in stock (No. 194a), keeping them firm; tie the head in a cloth and boil it for five hours over a slow fire: set it to cool for half an hour, unwrap it and reshape the head as near as possible by wrapping tightly around it a linen band, beginning at the snout and finishing at the base of the head: press lightly: when entirely cool unwrap. This head may be shaped in a specially made mold, then unmolded and glazed. 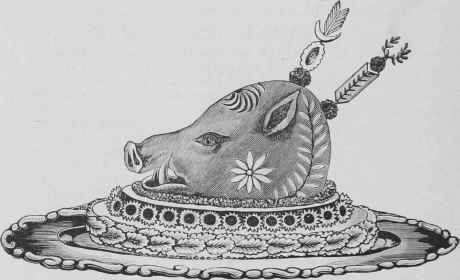 Reconstruct the head with imitated eyes and fangs, and glaze over the well-pared ears with meat glaze and Fasten on with skewers; lay it on an oval stand made of rice. in two parts, the lower part one and a half inches high the top part one inch high; on the edge of the lower one place a wreath of oak leaves; garnish the lower tier with truffles in paper cases and the base with chopped jelly and croutons, and ornament the head with some hatelets. Salt a pig's head for three days in a light brine or in sea salt; cook it in remoistening (No. 189), with onion, thyme and bay leaf added. After it is done bone it entirely and cut the meat into half-inch squares. Also cut a few slices from the fatty cheek part and with them line a square tin mold. Put the squares of meat in a receptacle sufficiently large to contain them, and mix together; add four finely chopped shallots, pepper, nutmeg, a soupspoonful of chopped parsley, a glassful of good white wine and a pint of melted jelly (No. 103): mix all together. Pour all of this into the larded mold, place it in the oven and let cook slowly for half an hour. Remove and cover with a board, having a pound and a half weight on top. Cut in slices and serve cold.